Is May Going to Be The Best Month Ever? Well at least the best month so far in 2012. Today is Star Wars Day so May the Fourth be with you. Cinco de Mayo, a full moon, and the Kentucky Derby tomorrow. Mother's Day is coming up and warmer weather. Then there is Memorial Day at the end of the month. Not too shabby, huh? I am sure there are a few more awesome days that I am forgetting but May looks promising. So take it from the dumb, white guy that May has all of the possibilities to be legend ... wait for it ... dary. It will be really, really smooth, everything will fall into place, and you will feel in complete control. And a special thanks to BuzzFeed for the cool GIFs and inspiration. P.S. Thank you for the birthday wishes, and during my trip around the blogosphere I ran across some cool music, "Kiss Me" by Ed Sheeran (Thanks RG) and "Storm" by the Yoshida Brothers (Thanks Jay). You know, I just heard about this "May the fourth be with you" thing today. No kidding around. I'm pretty out of it apparently. Hey, I liked this post a lot. I can't decide which is my favorite but I think I gotta go with nonchalant stair fall guy. That was awesome. I think I'll have to take a look at BuzzFeed. I agree about May being a good month ... hopefully the weather improves 'cause it's my birthday on 23rd, plus Mother's Day, whenever that is. I like the first video the best, pretty impressive! My month will also consist of shuttling my daughter to tests, dentists, and ortho appts. Yes indeed, a busy month. may should be good but i'm expecting june, july and august to be even better. i think we celebrate some dead queen's birthday in may. I like the way the guy that falls down the stairs plays it off. Like, I meant to do that. 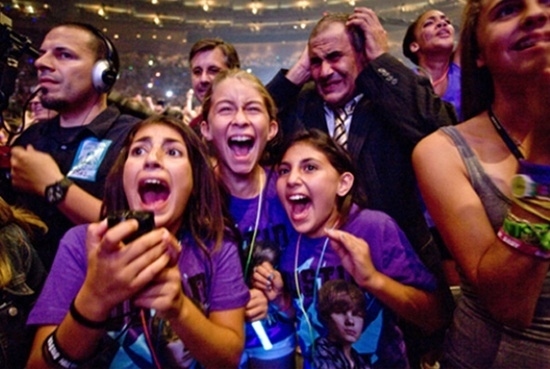 Holy crap that picture of the dad at the JB concert is priceless. Absolutely a picture is worth a million words. That guy playing it cool after falling down the stairs and limbo'ing under the rope is a lord. Love him. I am cracking up about the justin bieber thing because I am taking my girls to One Direction soon and I would really prefer bieber. At least I know his songs (because my daughter listens to them on repeat). I'm glad you liked the video I shared! Oh lordy! Save me from that concert assignment. I am very late and Star Wars day is gone until next year. I blew it! Had a good laugh at the last guy on the stairs. That would be me if I tried to do any of that.